Swathe in the beauty of this stunning cotton silk dupatta with ethnic print all over. It is emblazoned with gorgeous gold borders and delicate tassels, this piece will be a fine addition to your wardrobe. Amp up your ethnic quotient gracefully by throwing in this all over cotton silk dupatta in elegant ethnic print from the house of Dupatta Bazaar with a kurta or lehenga.Size: 88" inches / 2.25 meters length , Colour: Orange, Beige and Brown ,Fabric: Cotton Silk. The choice of versatile beige colour as the base colour and a sensational mix with vibrantly coloured bold ethnic print along with stunning gold borders makes this gorgeous dupatta simply irresistible! This dupatta can be used for work wear, occasion and festive wear! 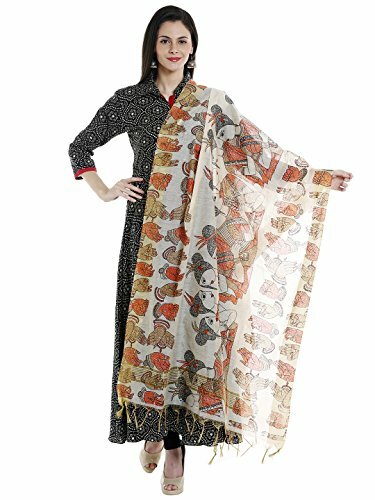 Let the creative side of you show by using unique ways of utilizing this dupatta. It can be made into a curtain, beautiful carry bag or can be used wonderfully to gift wrap something special. For viewing our complete range of stunning dupattas and scarfs please click on 'Dupatta Bazaar' above the title. Any Accessory/Top/Bottom worn by model is not included. If you have any questions about this product by Dupatta Bazaar, contact us by completing and submitting the form below. If you are looking for a specif part number, please include it with your message. 3 Layer Bhagalpuri Handloom Silk Dupatta/Stole (Silk thread lining between two woven layers) packed in a premium Jute Bag.